This page includes the webinar replay and all of the resources mentioned during the session. There’s no need to navigate to the page shown at the end of the webinar because it’s all right here for you! Click the replay link above to play the webinar recording directly from this page or to stream it from Vimeo. If you want to download it for offline viewing, right click on the video link below. The original webinar was quite long, so I edited the replay to include only the most relevant information. The webinar replay is one hour long. 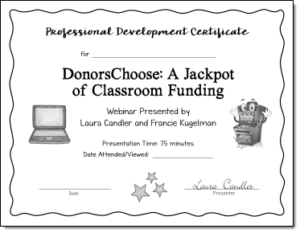 You may be able to earn professional development credits for watching this webinar. We don’t have the authority to award PD credits, but you can download this professional development certificate and check with your school or district to see if they will accept it. This certificate is for 60 minutes of professional development because that’s the length of the replay. How to Attend the Teaching Resources Summer Conference for Free!